Pistachios are nuts with a dry, hard, outer egg shaped shell, with a tasty kernel inside that are popularly consumed as a snack food. Botanically known as Pistacia vera, it is a fruit bearing tree which is native to Syria, Greece, Iran and Western Asia, but are also commercially grown in the United States, Turkey and Italy. In the Unites States, about 98% of all pistachios are grown in California. There is limited commercial growth of pistachios in Arizona and New Mexico as well. Pistachios are grown on trees and have naturally tan shells. The kernels inside the shells are a greenish tan. They get their greenish coloring from chlorophyll. Chlorophyll is a natural pigment that gives leaves their green color. The pistachio trees grow about 10 meters high on an average. It is a desert plant, which explains its origin in western Asia. The pistachio nut is a culinary nut. Pistachio tree grows well, even in high salinity soil. Every pistachio tree doles out about 50 kg of Pistachio seeds every year! Iran is the largest producer and exporter of Pistachio. Pistachios are typically sold with the shells partly open and the kernels peeking out, making the task of separating the kernels from their shells easy. The shell actually opens on its own during the growth process. As the pistachio nut grows, it expands until it pops its shell open. Sometimes, pistachio shells don't open on their own. Often, this is caused by immature kernels that don't grow properly. Such nuts should usually be discarded. Many individuals are familiar with pistachio nuts with red shells. The red shells are the result of dyeing for aesthetic appeal, not necessity. Though some enjoy the red color, many believe the red dye adversely affects the taste of the pistachio kernels. The red dye may also stain clothes and hands. Pistachios are not just enjoyed as a snack food; they are also used in baking and cooking. Their unique texture and coloring makes them a popular addition to salads and appetizers. They are also a frequent addition to entrees and desserts. Pistachios are sold in many different forms. You can find them roasted, with or without salt, and raw. You can even find them coated with candy. For those who prefer to avoid dealing with the shells, pistachios can be purchased without shells. Pistachio nuts can usually be purchased in supermarkets, produce stores, and gourmet food shops. They can also be found in candy and nut stores, as well as from a variety of online vendors. Pistachios can even be purchased from mail-order catalogs. There are many different varieties of pistachios. However, the Kerman variety, grown mostly in California, is predominant in the United States. Pistachio trees can live for quite a long time. In fact, there are pistachio trees in the Middle East that have been thriving for more than two centuries. They are still going strong! We would begin the pistachio nutrition information with a table listing out the nutritional values of the nut. Note that, the values have been given for a serving size of 100 grams, and the percentage values are according to a 2000 calorie diet. Calories in pistachio nuts (for a serving size of 100 g) = 568. The first and foremost benefit of these nuts, that must be mentioned, is associated with a healthy heart. Because they are rich in monounsaturated fatty acids, they are one of the most healthy options for heart. They work to reduce high blood pressure. So when these two factors are taken care of, it is obvious that cardiovascular diseases would have lesser chances to set in. Another important pistachio nutrition information which is also a must-mention is about its property to improve vision. The antioxidants that are contained in this nut are believed to be found in no other nuts. These antioxidants fight free radical damage, and reduce the risk of developing age-related macular degeneration. The nuts' richness in copper, magnesium, and B vitamins, work to strengthen the immune system thus, preventing a number of diseases. One more benefit of the high content of antioxidants in these nuts is a reduced risk of developing cancer. These antioxidants basically reduce cell death thus, this benefit. If you are a vegetarian then you would be delighted to know about this pistachio nutritional information that, these nuts can help fill the gap of protein in your diet. Combine them with grains, vegetables, fruits, and seeds, and you can have the required dose of protein for healthy body functioning. You are well aware of the benefits of fiber in foods. Two very important benefits include weight loss, and improved bowel function. Including these nuts in your regular diet, can help you reap all such benefits. Conditions like type 1 diabetes, metabolic syndrome, erectile dysfunction, stroke, dementia, allergies, arthritis, other immune problems, etc., can be prevented or treated to some extent with the regular consumption of these nuts. These nuts are rich in phytosterols. These are plant sterols which reduce the absorption of dietary cholesterol from different foods. This help in bringing down the levels of LDL 'bad' cholesterol in the body. Being a good source of dietary fiber, eating pistachios in reasonable amounts can benefit the smooth functioning of the colon. Dietary fiber in daily diet ensures proper bowel movement. Intake of pistachios that contain good amount of fiber will ensure that the bowel functions correctly. This is one of the pistachio health benefits that simply cannot be overlooked. For a healthy immune system, adequate intake of vitamin B6 is essential and to achieve it what better way than eating a handful of pistachios. Vitamin B6 is vital to keep the immune system functioning properly. Lack of vitamin B6 can negatively affect brain activity as well as make the immune system ineffective for fighting infections. Therefore, pistachios can certainly help in boosting immune function. 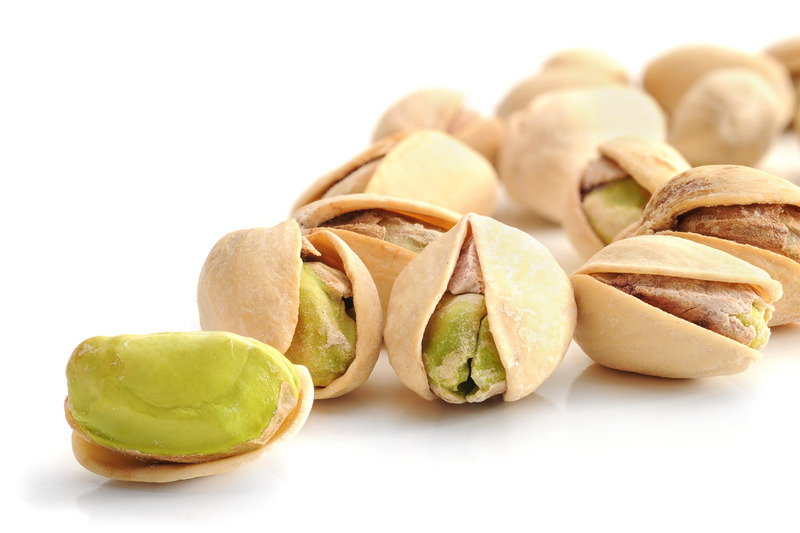 Vitamin B6 found in pistachios also helps the body in making healthy red blood cells. One of the most talked about pistachio health benefits is related to the skin. For a healthy complexion and skin, it is often advised to have foods high in vitamin E. The reason is simple: vitamin E does an excellent job of keeping the skin away from UV damage. Fortunately pistachios contain vitamin E, that means eating these nuts daily will also provide protection against UV radiation. A healthy younger looking skin is certainly not a distant dream if you are snacking on pistachios. Eating pistachio nuts in moderation can go a long way in keeping the heart healthy. This is because pistachios are excellent sources of monounsaturated fats that can play a vital role in lowering bad cholesterol. As we all know, bad or LDL cholesterol are the main culprits behind choked up arteries that cuts down the blood supply to the heart, eventually causing a heart attack. However, this health hazard can be avoided if pistachios are included in the diet. So an easy solution to prevent heart ailments from occurring is to have a handful of pistachio nuts everyday. Studies have proved that pistachios have an amazing ability to bring down cholesterol, thanks to their high concentration of monounsaturated fats. Therefore, heart patients following a low fat diet, make sure to add pistachios in their daily meals. One can say that a healthy diet complemented with pistachios is definitely a powerful tool for a healthy heart. Pistachio health benefits are not just limited to protecting heart health. Eating pistachios help to promote eye health too. They contain carotenoids that have shown to protect the eyes from age related disorders like cataracts. It won't be wrong to conclude that pistachios and eye health go well together. The chances of retina damage that occur with age are minimal when carotenoid rich foods and snacks like pistachios are included in the diet. So, if you are concerned about maintaining sharp vision, have pistachios in moderate amounts daily. Pistachios are stockpiles of Arginine, which play an important role in the metabolic processes of the body. It helps in increasing the nitric oxide levels of the body. Now, how is that important? It is important because, nitric oxide prevents the buildup of blockages along the arterial walls of the body. Arginine, better known as L-Arginine, is known as the "miracle molecule", which helps in improving functioning of many body processes. Monounsaturated fats do not get saturated inside the body. Especially, they do not get stored along the inside walls of arteries. In short, they are the good fats which get burned easily, without getting piled up. One of the interesting facts is that it has copious amounts of these monounsaturated fats. After intense research, it has been found that, consumption of pistachios reduces the amount of cholesterol in blood. Let us look at the calories in pistachio nuts. In one cup of pistachio nuts, there are about 713 calories. Out of these, 512 calories come from fats. The majority of fat content is in the form of monounsaturated fats, which reduce low-density lipoprotein (LDL) cholesterol, reducing the risk of heart disease. Cholesterol is the main culprit behind most of the heart disorders. Though not yet confirmed, pistachio consumption may possibly increase the levels of high-density lipoprotein (HDL Cholesterol). So, make it a point to include about two to three ounces of pistachio in your daily diet. It will reduce the risk of cardiovascular diseases. Pistachio consumption reduces the stress related, elevated blood pressure levels, by as much as 10%. This is one of the most important pistachio nutrition facts, you will come across. Pistachios are storehouses of important anti-oxidants, which can prevent the damage to the cells of the body. Higher anti-oxidant levels in the body reduce cell death and risk of cancer. The anti-oxidants present in pistachios are vitamin A, vitamin E and Lutein. It is also a rich source of proteins, which help in building up of the body. Another reason for including pistachios in your diet is their phytosterol content, which helps reduce cholesterol levels, leading to a drop in cardiovascular heart disease risk. Research has revealed the ability of phytosterols in reducing cancer risk as well. About 100 gm of pistachios contain 279 mg of phytosterols! Half a cup of pistachios can supply adequate quantities of some of the most important minerals required by the body like Calcium, Iron, Magnesium and Copper! It's especially well stocked with calcium and iron, which are minerals playing very important roles in the body. Calorie count is sure to rise if pistachios are consumed in excess. Eating just 49 kernels or 1 oz of pistachios increases calorie intake by 158 calories. This means 100 grams of pistachios contain around 600 calories, which is significantly high. However, calorie count of pistachios is lower when compared to other nuts like almonds and walnuts. Nevertheless, mindful eating is expected when it comes to including pistachios in the diet. Indulging in excess amounts is likely to cause weight gain, which may lead to obesity. Although nutritional benefits of pistachios are numerous, one has to be very careful when it comes to buying these nuts. Eating salted pistachios every day may raise the blood pressure. Considering this fact, avoid the salted varieties, and most importantly don't forget that sensible eating is required to enjoy their benefits. Although pistachio nuts are relatively healthful, eating too many could have side effects on your weight, blood pressure and gastrointestinal tract. People who suffer from food allergies, especially tree nut allergies, should consume pistachio nuts with caution.